Providing patients in Dublin with advanced preventive dentistry solutions. Preventative dentistry refers to dental care methods and procedures that aim to do just as it sounds: prevent oral problems before they begin or catch signs of concern early on before small issues become serious. Preventative dentistry is our favorite branch of our work because it is a smart and easy way to stay in control of your health. The practices involved in this area of dentistry are non-invasive and easy to stay on top of. By following the lead of Dr. Huang, together you can keep your mouth and teeth healthy and problem-free! So many serious oral health concerns begin as small, manageable problems. Regular visits to All In One Dental and maintaining good oral hygiene routines at home, those small problems can often be avoided in the first place. When the circumstances cannot be avoided, Dr. Huang will have you covered by tackling those issues early before they have any chance to develop into a serious health concern. Dental exams, cleanings, cancer screenings, and at-home care are some examples of preventative dentistry procedures and practices. Teeth cleanings and oral exams by your Dublin dentist are your first and best line of defense in terms of preventative dental health care, right next to a great at-home oral hygiene routine. Making sure to schedule cleanings and exams on a regular basis is key to good dental health and the overall maintenance of your teeth. Preventative dentistry is all about avoiding issues like cavities, discoloration, bad breath, and gum disease and minimizing the problems that do pop up with early detection and optimal solutions. The oral exam process includes a few steps that allow your dentist to check on the health of your teeth, tongue, and bones and soft tissue of the mouth. Be sure to let Dr. Huang know of any sensitivity, pain, or concerns you may have noticed since your last exam. The dentist is looking for a number of items during a routine exam including tooth decay, gum disease, the condition and security of any prior dental restorations, and any potentially problematic sores, lumps or cysts that may be indicative of cancer or another serious health concern. X-rays are taken during an exam to look within teeth and the bones of the mouth to ensure that all is well. 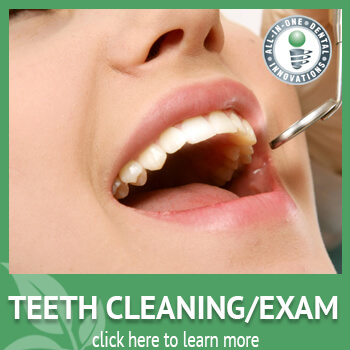 The cleaning portion that follows the exam will include a professional and thorough, deep cleaning of all teeth to remove tartar, plaque, and surface stains. For most, exams and cleanings should be scheduled with your dentist every six months. Unfortunately, tooth decay can be a very common occurrence for individuals of all ages. Luckily, however, tooth decay is also easy to prevent and keep in check if the correct steps are taken at home and with your dentist. Decay begins with the softening of the enamel of the teeth and when left unchecked, will lead to the formation of a cavity (or a potentially more serious issue). Fluoride is a naturally occurring mineral that can help keep your enamel strong and healthy. 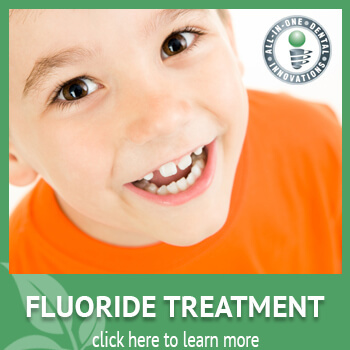 Children can especially benefit from fluoride treatments as it binds particularly well during the development of their permanent teeth. Fluoride reaches our teeth in a few different ways including tap water, toothpaste, and mouthwash. While helpful in our strides for healthy teeth, these means of receiving fluoride can be limited. Especially for children, scheduling fluoride treatments alongside cleanings and exams can be incredibly useful in building strong adult teeth that can last them a lifetime. Adults can also benefit from fluoride treatments as a preventative measure to help maintain strong enamel as we are all susceptible to potential tooth decay. Adult patients who are especially at risk for enamel concerns such as smokers or those who regularly experience dry mouth may see a particular improvement from fluoride treatments. The actual treatment is a simple, entirely pain-free procedure. Fluoride gel or foam is inserted into in a plastic tray that is placed on the top and bottom rows of teeth for several minutes. Remember not to eat or drink for about thirty minutes after a treatment for best results. Back teeth, in particular, are especially prone to tooth decay as they readily come in contact with food and small particles can easily get lodged in the grooves of the bite surfaces. Dental sealants are plastic coatings that can be applied to the back teeth of children or adults to aid considerably in the protection against tooth decay. Children and teens especially experience a fair amount of decay on the bite surfaces of the back molars. By applying sealants to the first set of molars, it can greatly help to reduce decay and the potential future need for more invasive procedures. Sealants can also aid in making sure that your child’s oral health is in prime condition for the arrival of (healthy!) adult teeth. Adults can also benefit from dental sealants–particularly those prone to decay or cavities. The sealant creates a smooth surface that makes thorough cleaning much easier by reducing the potential of missed nooks and crannies in the molar biting surfaces. 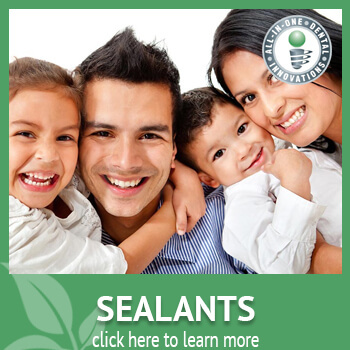 The application of dental sealants is quick and entirely pain-free. A specialized gel is first applied to the molar(s) that will be sealed. This gel will create a slightly rough surface for optimal binding of the sealant. Once the gel has completed its process, the surface is cleaned and the sealant is ready to be applied. Dr. Huang will apply the sealant to the tooth and with the use of a light to speed the hardening, the procedure is over. With proper oral hygiene, sealants can last for many years. Routine dental exams and cleanings are very important to your overall oral health, but most of the care that your teeth receive is at home. A good at-home oral hygiene routine covering all the important bases is your best tool to keep your natural teeth healthy, beautiful, and free from the need for restorative dental procedures and solutions. Patients often ask how long each brushing session should last and, ideally, at least two minutes of brushing time is highly recommended. An electric toothbrush does a great job of removing tartar and giving your teeth a thorough cleaning. Whether you choose an electric or manual toothbrush, be sure to always get the softest bristle possible. Rougher bristles can put too much wear on your teeth and gums. In terms of flossing and rinsing, these should also be performed twice a day. Proper flossing entails making sure to floss both sides of each tooth. This can allow you to unlodge anything trapped between teeth, including particles you may not be able to see. After flossing, rinse well with mouthwash. Adding a fluoride mouthwash to the fluoride you get from your toothpaste can help ensure you’re getting that added boost of enamel protection. In speaking with our patients about oral cancer and the specific parts of the body that it affects, we find that by and large, it is not a type of cancer that is discussed often or promoted in terms of awareness and prevention. 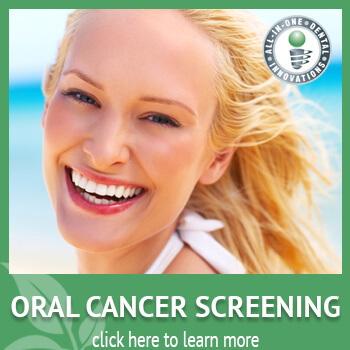 Also, most are not quick to associate dental exams with cancer screenings. The fact of the matter is, however, that oral cancer is a serious concern with up to 50,000 new cases in the United States each year. At All-in-One Dental, we take cancer screenings very seriously and you can be sure that during any procedure or exam, Dr. Huang is looking out for indicators of serious concerns like oral cancer. Making sure that oral cancer screenings are always included in your routine dental exams is the absolute best way to remain on top of your health. While it is true that lifestyle choices like smoking cigarettes can increase your likelihood of developing some type of oral cancer, it can still happen to anyone. If you or your dentist does spot a suspicious sore or cyst, for example, early detection and medical intervention are likely to provide for a very positive outcome. During a screening, Dr. Huang thoroughly examines the mouth and parts of the head and throat either by sight, touch, or x-ray. If it happens that something is found, know that you are in excellent, well-qualified hands. Be sure to ask your dentist when cancer screenings should be added to your routine oral exams.